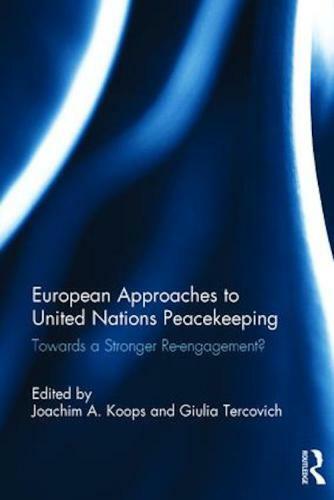 GGI is pleased to announce the publication of the Routledge Edited Volume on ‘European Approaches to United Nations Peacekeeping: Towards a stronger Re-engagement?’, edited by GGI’s Joachim Koops and Giulia Tercovich. 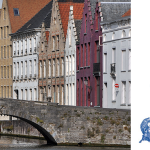 The Edited Volume published by Routledge is one of the outcomes of the ‘Europe’s Return to UN peacekeeping’ Collaborative Research Network (CRN) granted to GGI by the Academic Association for Contemporary European Studies (UACES). 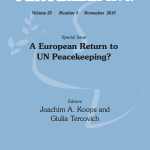 This volume provides a comprehensive analysis of European approaches to United Nations peacekeeping by assessing past practice, present obstacles and future potentials related to nine core European countries’ contributions to blue helmet operations. 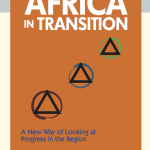 By providing in-depth case studies on Denmark, France, Germany, Ireland, Italy, Norway, Sweden, The Netherlands and the United Kingdom, this book offers an evaluation of European approaches as well as a wide range of facilitating and constraining factors related to the above mentioned countries’ future involvement in UN peacekeeping. 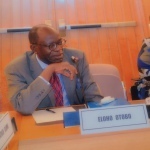 The book places particular emphasis on the recent involvement of European countries in the UN operation in Mali (MINUSMA) and explores to what extent this experience might lead to further marked increases of European supplies of troops and capabilities and thus a broader ‘European return’ to UN peacekeeping. Each chapter offers an up-to-date case study on key countries’ policies, challenges and opportunities for a stronger re-engagement in UN Peacekeeping It provides a comprehensive analysis of the main challenges and concrete ways ahead for overcoming institutional, political, financial and military obstacles (both at European capitals and within the UN system) on the path towards a stronger re-engagement of European troop contributing countries in the field of UN Peacekeeping. 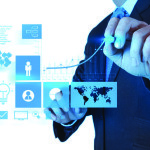 Furthermore, each chapter includes a set of policy-relevant recommendations for future ways ahead. The chapters in this book were originally published in International Peacekeeping. 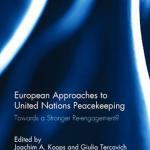 For the ‘European Approaches to United Nations Peacekeeping’ Edited Volume, please click HERE.